This morning was one those occasions where it was just too nice to pass up a quick trash patrol of the Sudbury River in Wayland. I launched at River Rd. 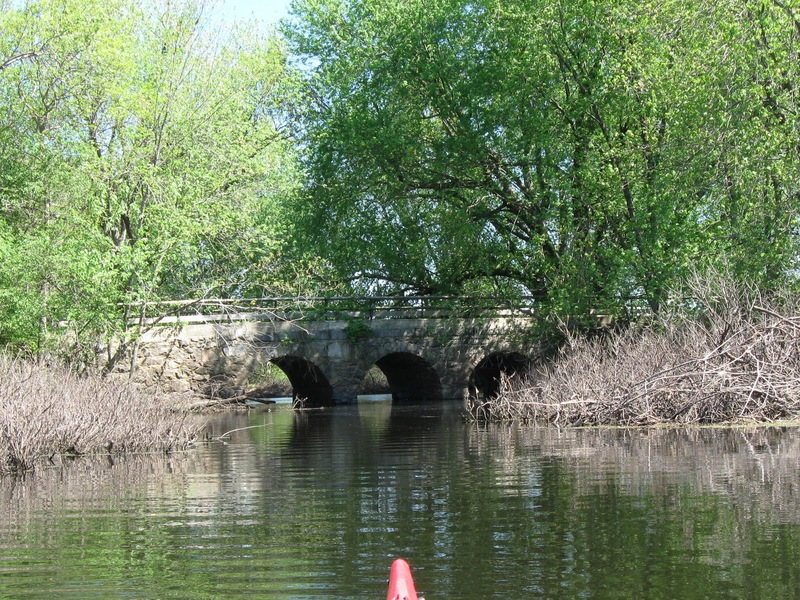 and paddled downstream to where the original course of the river passed under this old stone-arched bridge. Finding only a few pieces of trash, I turned around and headed upriver and was pleasantly surprised to find very little trash between River Rd. and Route 20. Skies were sunny and the air temperature was in the 70s. Eastern Kingbirds and red-winged blackbirds were plentiful and I saw my first batch of mallard ducklings. All but one of the passageways through the structure were blocked with a massive raft of driftwood and trash. There were two tires, a propane tank, and a large amount of flotsam. I concentrated my efforts on the flotsam and after about an hour's work, my boat was loaded. Would have been a good place to employ the "Come Hither" but unfortunately it recently went yonder. A replacement is in the works. There were quite a few glass bottles today. Considerably more hard liquor containers than beer or wine. The 111 pieces of trash brokedown as follows: 60 recyclable containers (4 redeemable) and 51 pieces of miscellaneous rubbish such as stryofoam, plastic bags, nip bottles, a cooler top, and fishing gear. The fishing gear included clumps of monofilament line, bobbers, and a very realistic looking Slugo eel. 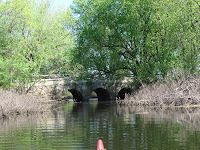 After including the 3 pieces from Sunday's paddle on the Essex River, my YTD total stands at 2080.